Throughout the years in Philadelphia, there have been many coaching era’s in all sports, but few have had the success of Charlie Manuel. Charlie is a baseball relic, who has knowledge in his repertoire that hasn’t even begun to be tapped into. Manuel was a world-class standout in Japan as a player and started to get noticed in the majors with his stint managing the Cleveland Indians. He was always known as a players coach and developed a respect amongst his players that became a unbreakable bond that kept them motivated. This became evident in Cleveland with Manny Ramirez, and so far here in Philadelphia, with Jimmy Rollins. In the world of sports, there are many types of players and personalities, so having someone who knows how to handle them will always be a big advantage to any organization. In 2005, the Philadelphia Phillies decided to promote Charlie to become their 51st manager in team history, taking over for the fiery Larry Bowa. The feeling within the organization was that Bowa’s tactics had lost their luster and it was time to take a different approach to get their young players to respond. Fortunately, the move worked exactly the way they had planned, leading the team to 2 National League Pennants and 1 World Series Championship. Players seemed to be motivated again and were willing to lay it all out on the line for their new manager, whom they considered a brilliant teacher. This would prove to be evident during a game broadcast, when you would constantly see players next to Charlie asking for advice or just following the game. I do not think I’ve seen this replicated anywhere throughout the league, showing the special bond that was existent among these players and their head coach. Throughout the media, there were whispers of the clubhouse being run like a country club, but the laid back atmosphere seemed to be warranted, as the players would always step their game up when necessary. Winning is a cure for any skepticism that exists, as it forces people to enjoy the product being displayed, not necessarily picking it apart. In the last few years, as players have gotten older and injuries continue to be a concern, Manuel seems to be the only stalwart who is able to keep this team together. It was evident last year, as a team without Chase Utley, Ryan Howard, and Doc Halladay, three integral parts of the team, were sidelined most of the year and still fought their way to a .500 season. I am not justifying their horrific season last year, instead commending Charlie Manuel for getting players like Kevin Fransden and Eric Kratz to contribute, salvaging what could have been a much more devastating year. In this, the last year of his contract, it will be interesting if the Phillies decide to keep him around as the leader or they decide to go in another direction like they did 8 years ago. 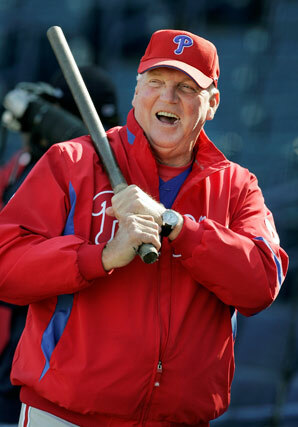 Either way, the Phillies would not have found their success without Charlie Manuel, who could arguably go down as the best Manager in Philadelphia Phillies history!